position Position in 3D space as seen from the current handle camera. text Text to display on the label. image Texture to display on the label. content Text, image and tooltip for this label. style The style to use. If left out, the label style from the current GUISkin is used. Make a text label positioned in 3D space. Labels have no user interaction, do not catch mouse clicks and are always rendered in normal style. 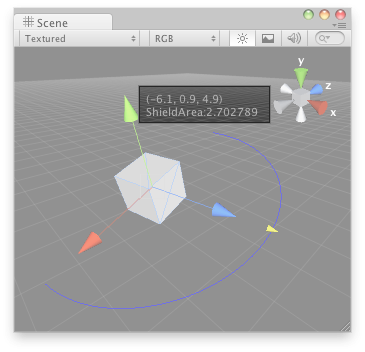 Label in the Scene View. //Create a folder and call it "Editor" if one doesn't already exist. Place this script in it.